Lough Swilly is a deep water estuary approximately 12 miles long and up to 3 miles wide running from the Atlantic in the north to Inch Island in its south. The entire length of Lough Swilly is marked with various easily identified navigation lights along the main “deep water” shipping channel. Inch Spit light (Fl.R3s) marks the northern entrance to Fahan Channel and onwards (approx 2 miles) to Fahan Marina. Approximately 900m south of Inch Spit light lies the shallowest and narrowest section of Fahan Channel, known as Fahan Bar. Fahan Bar is the northern tip of Inch Flats, which are roughly triangular in shape having their base line at Inch Island, and which run northwards to its peak at Fahan Bar. 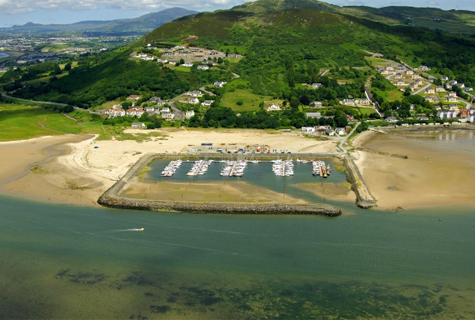 Along the east side of the triangle of Inch Flats runs the Fahan Channel while on the west side lie the deep waters of Rathmullan Channel (18+ metres). The red navigation light known as Inch Spit marks clear water beyond Fahan Bar. All boats are advised to avoid crossing over Inch Flats, unless there is sufficient tide height. Appearances can be deceptive since at low water springs parts of Inch Flat actually dry out. The channel will be marked with port-hand buoys from March 2012 so ideally stay as close to the marks as possible. Coming in: Fahan Bar is approx. 5 cables (900m) south of Inch Spit light (Fl.R3s). Be careful of Carricullion rocks which lie 4 cables (750m) due east of Inch Spit light, and are submerged at high water. With Inch Spit light directly to stern, steer 185T for 9 cables (1650m) from the light to the marker buoys at Fahan Bar, then steer 156T for approximately 9 cables (1650m) up Fahan Channel. Be guided by the port and starboard markers to the Marina entrance. A red buoy (east side) is positioned directly opposite the Marina entrance which is on the south west corner of the Marina enclosure. Going out: Parts of the Marina concourse are not fully dredged but the red/green markings on the black piles will lead to deep (5m at LAT) water just outside the entrance to the Marina, at the beginning of Fahan Channel. Fahan Channel is a relatively deep water course approximately 50-100m wide which runs roughly north south close to the Fahan (east) shore. Steer 336T for Macamish Point from the Marina entrance for approximately 9 cables (1650m) then steer 020T for a further approximately 4 cables (750m) to achieve deep water just south of Inch Spit (Inch Spit light Fl.R3s).